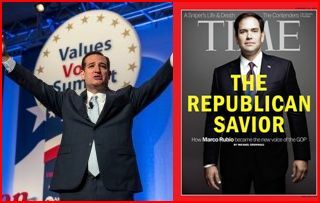 Sen. Marco Rubio finished in fifth place with five percent of the vote in the Value Voters Summit straw poll yesterday. I guess his part in the Gang of Eight Amnesty group didn’t sit well with Conservatives. Budget whiz Rep. Paul Ryan came in sixth with four percent. Read the story at: Breitbart.com. This entry was posted in 2016 Elections, Executive Branch, Healthcare, Immigration, Major News Items, Media, National, Tea Party and tagged Ammnesty, Ben Carson, Cruz, Gang of Eight, Marco Rubio, Paul Ryan, Rubio, Ted Cruz, Value Votors Summit. Bookmark the permalink.